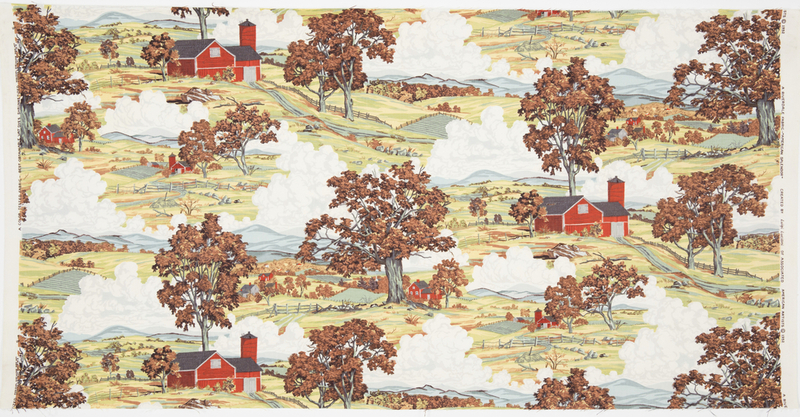 Aptly titled “American Splendor”, this textile captures the quintessential glory of the New England autumn landscape with its fire engine-red barns, rustic wooden fences, billowing clouds, and white church steeples nestled among the distant trees. Burnt orange foliage decorates the sunny and bright rolling pastures, signaling the crisp autumn air. The artist, Luigi Lucioni (American, b. Italy, 1900–1988), was renowned for his Americana-themed landscape paintings and etchings. Born in Italy and raised in northern New Jersey, Lucioni resided in New York City during the winter while the summer months were spent at his farmhouse in Vermont. Once dubbed “Vermont’s painter laureate” by Life magazine, the pastoral landscapes of the state were a great source of inspiration for Lucioni. In a 1946 advertisement, Maxwell House featured one of Lucioni’s Vermont illustrations (Route 7), captioning it, “Like the warm red farmhouses and cool blue-green mountains of Vermont, Maxwell House Coffee is part of the American scene”. “American Splendor” was part of a 1952 collaboration between Associated American Artists and Riverdale Fabrics to produce a collection of eight original Americana-themed fabrics demonstrating several painters’ approach to textile design. The collection was titled “Pioneer Pathways” and sold at Macy’s and Bamberger’s. “American Splendor” was available in both autumn and summer color schemes (summer version shown below). Janice Shapiro Hussain is the Digital Imaging Specialist at the Cooper Hewitt, Smithsonian Design Museum.